Gov. 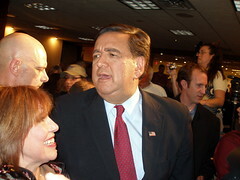 Bill Richardson made his departure from the presidential race official Thursday. My story in the New Mexican can be found HERE . My new Capitol Bureau partner, Kate Nash did a story pondering what's next for the governor. You can find that HERE . Richardson's withdrawal was expected. But one surprise today was how he treated the New Mexico press corps. Before Richardson appeared in the Rotunda, his chief campaign flack Pahl Shipley announced that Richardson would not answer questions after his announcement. That in itself isn't exactly surprising. While I was in Iowa and New Hampshire the past few days, practically the only thing that Richardson spokesman Tom Reynolds ever said to me was "The governor's not taking any questions." But where did Richardson go immediately after his speech? To the Capitol television studio to do interviews on Fox News and CNN. Watch Matt Grubbs' report on KOAT -- specifically the last part. You'll see campaign aide Katie Roberts telling local reporters to "please show respect" for the governor as he goes about his "official business." Official business meaning holing up in the television studio for an hout and a half so he could be on national t.v. After chatting it up with Wolf Blitzer and Neil Cavuto, Richardson left the studio, not saying a word to New Mexico reporters, surrounded by aides who hustled him up a nearby stairwell. That's also shown in the KOAT report. This made me think of a recent interview with a political science professor in Iowa who told me that Richardson "seemed to be playing to the national media that's here and not Iowans." A few hours later, while Kate and I were working on our stories, Richardson once again went to the capitol studio which is next to our office. He shouted playfully, "I snubbed you guys" before going in the studio. When he was finished (and we still were slaving away on our stories), Richardson tapped on our window. I asked, "Why did you snub us, governor?" He just smiled and kept walking. Like it was a big joke.